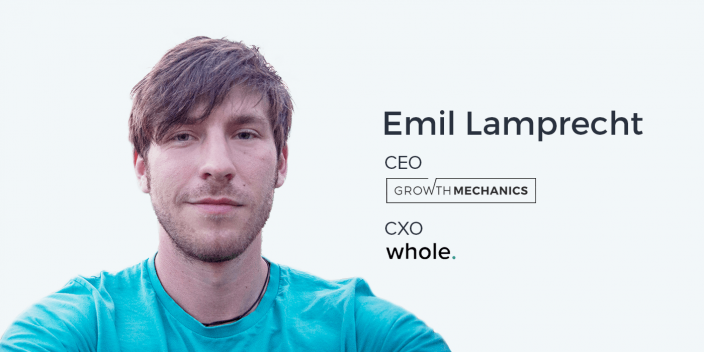 Emil Lamprecht is CEO of Growth Mechanics, marketer behind the success of Europe’s #1 EdTech Startup, and manager of Google’s entrepreneur programming. He has worked with hundreds of startups and built several of his own. At Growth Mechanics, Emil designs and develops entrepreneurship training programs for corporations, education companies, investors, and philanthropic funds. In addition to his current work as the CEO of Growth Metrics and Chief Experience Officer of Whole Design Studios, Emil recently spent six months as the interim CMO of Athletic Greens, a high-quality greens and whole foods supplement product. Check out his webinar for an entreprenuer starter-kit, or follow Emil on twitter @Emillamprecht. There’s nothing wrong with having a go-to set of tools, and methodologies to tackle a marketing or growth related problem. In fact, it’s likely that most, if not all, marketers have a preferred marketing stack or toolkit. Despite the general and tested efficacy of your ideal combination of SaaS products and frameworks, it’s possible that they might not constitute the right solution for your current product. Flexibility with your marketing stack and prefered acquisition channels will allow you to discover a more optimal solution to current marketing problems for your business or your client. No matter how much data and experience from previous campaigns you have, no marketing tactic or strategy, new or old, is guaranteed to drive growth and generate ROI. In fact, it’s best to assume that some of your marketing initiatives fail. Doing your due diligence and best research to manage expectations and take risks where appropriate can mitigate situations where only 10% of your effort gets through. It also allows you focus your efforts on the results that matter most. Frequently, founders built products based on their personal experiences and pain points, or the struggles experienced by those around them. While personal experience can certainly help to inform hypotheses and ask the right questions, assuming something to be true based on a small and personal sample size is not always the best choice. Diving deeper into your assumptions and asking why they might be the case will help separate you from the potentially uninformed product offered by your competitors. Ander: Well, it’s always interesting to talk to marketers and all-star business people from all over the world – especially when they are traveling all over the world. And that is one of the many things that the guest for this episode is doing. Emil Lamprecht. Emil, pleasure to have you here on the show. Emil: Thank you very much. Ander: Yeah, thanks so much for taking the time to come on and chat. You have quite a diverse portfolio, to say the very least. You are the interim CMO over at Athletic Greens. And in fact, instead of me listing off everything myself, why don’t you tell us just a little bit about who you are, what you do? Emil: Sure, absolutely. I think my story is quite divergent depending on where you start it. I’ve had what amounts to several distinctly very different careers that I’ve worked hard to interweave to each other. But as of late what I really do is act as an entrepreneur with my own companies of course, and historically have a history of that. But as much as possible, I try to extend that learning either as part of the businesses that I work with and/or own, or in helping friends and other companies who have interesting problems find a better path forward to a more sustainable future in terms of the ideals of economic stability and sustainability, and then, where possible, any other variation of sustainability where it can be applied, whether that be in a social or an equity context or anything else. That’s sort of the briefest nutshell version. Ander: The briefest nutshell version. And that would also include experience at Google, experience at CareerFoundry – which is, I believe, one of the biggest ed tech companies in Europe – and then of course your own agency, Growth Mechanics, as well. CareerFoundry is arguably Europe’s number one leading ed tech platform, though a huge percentage of our audience is actually in the United States. I was part of the founding team that built that up and launched it and brought it to market and it’s doing very, very well. It’s based in Berlin, Germany. And on the side of that, I have worked with Google, predominantly as an advisor to their entrepreneurship programming. Emil: I have worked historically with their head of startup programs, both in London and in Silicon Valley to develop the launchpad startup programs that they now run internationally, both in major and emerging markets. And it’s a very unique set of models that they use, in part based off of what we do at Growth Mechanics, which is design entrepreneurship programming. We actually have, as far as I know, the only real accelerator-in-a-box style model that can be implemented or white-labelled as an accelerator program. We used a lot of those elements for Google and with Google and then, as a result, we’ve seen their programs literally blow up all over the world and make some of the most targeted ecosystem impact out there. But all of that really stems from a background in love of product and love of marketing. I can talk all day about entrepreneurship topics but it all comes and stems from a holistic look at product and marketing product and development, particularly early-stage development of product – first physical products and media products and then later now where I am, which is mostly in the tech world – and understanding how, through that process, to create better approaches to market and better ways of bringing things to a public that need it or can proactively use it and therefore not try and sell, sell, sell but sit comfortably in the knowledge that you’re providing something with what they want, and as a result, sort of have a cyclical relationship with customers that grow a larger basis for customers. Ander: How is this unconventional portfolio, this unconventional journey of success that you’ve established, contributed to your philosophies on marketing and product growth? The foundation for that question is… what are your philosophies on those two things? Emil: Haha. What are my philosophies? I think, Ander, that’s a question that I could probably ask myself every day. Ander: Of course, yeah. Haha. Constantly evolving. Emil: Yeah. I think the key to that question is understanding that the best philosophy to have, particularly in the business world and the marketing world, evolves and changes violently day over day, week over week, month over month, right? Emil: Probably at Instapage I’m sure you guys have seen massive shifts in how people are choosing to use things based on what type of funnel or what type of customer approach is popular that quarter. Emil: So one of the things that I find a lot of entrepreneurs but also marketers are very guilty of is taking a very religion-like approach to the methodologies and systems that they use. They grow up with an ideal – and I mean grow up as a professional with an ideal – and they manage to implement that ideal once or twice or three times and they see it work in specific types of cases. But in the next case, instead of taking an agnostic approach to what are the tool kits that we could use to possibly make this happen, their sort of personal call to action is, ‘Well, this has worked before so it will work again. We’ll use only this.’ And I think the philosophy that I personally hold onto and I try very hard to bring into the teams that I work with – whether it’s Athletic Greens and working as their interim CMO and trying to help build that culture up in a way so it’s proactively growing internally and externally – it was a matter of getting them to look beyond the same tools they’ve been using for five years, right? Having an agnostic-view of that and then teaching yourself to analyze those tools as potential solutions to determine which one is the best based on all the stakeholders – not just yourself and your own preferences but your colleagues on the board and below – enables you to really grab something and go in a way that’s much more proactive than trying to force-feed whatever system you’ve historically had luck with into your next project. Ander: Right. Breaking through the noise requires some level of flexibility, especially if you’re going to be experimenting with new channels or learning how a new type of marketplace works or anything like that. Emil: Yeah, absolutely. Adaptability is one of the factors that we evaluate in entrepreneurs when we do, let’s say, selection for accelerator programs, for instance. There’s several different interviews and everything that entrepreneurs have to go through for our systems. But most of that is focused on sort of on-boarding them to a flexibility of mind and testing how adaptable they are. If you were to ask me what is the single most outstanding personality factor of successful entrepreneurs, a lot of people in Silicon Valley would point to being, you know, determined, not afraid to fail, pushing for what they believe in, or any number of other factors but honestly, adaptability – which is a subset of creativity – so not creativity in itself, because that can be very distracting for a lot of people. Emil: But adaptability, which is a subset, is the ability to take problems as they stand and be creative within that bubble. That is the single most outstanding personality factor that we’ve identified in successful entrepreneurs. Ander: And this is something that you’ve experienced yourself as well. We talked previously offline in a private conversation about how you got involved with Athletic Greens and I’d love to shift our conversation towards that because the supplement industry and how you approach those kind of growth problems is quite different than a lot of other products, especially within the technology space. Could you tell us a little bit about how you got involved with that company and maybe some of the interesting growth challenges that you’ve discovered as being a part of that growth process? Emil: Sure, absolutely. Athletic Greens, for those who don’t know it, is effectively a very, very high-quality – perhaps the highest efficacy – greens product and supplement product on the market. It was started seven years ago by a man named Chris Ashenden who is a Kiwi, he’s actually New Zealand-based, and was brought to market out of his own need to fix a series of digestive health issues that he was experiencing at that time. That’s sort of win #1, right? Like, the second you have someone who’s proactively solving a genuine problem – not one that’s just personal, like an annoyance, or not something that’s scratching your own itch but solving a genuine issue which is, in this case, a health issue, and that can be reflected in other people, you have a basis for product success that is unprecedented compared to other things, compared to, ‘This annoys me so I’d rather have that solution instead.’ This is something that is inherently competitive in a way that’s very dangerous and hard to sustain whereas something that’s built around solving a genuine problem that people don’t have a solution to, this is really interesting. That’s actually why the conversation with Athletic Greens started. They came to Whole Design Studios, which is an agency I run with my colleague Giles Thomas. We’re a holistic UX agency and we specialize in e-commerce, specifically Shopify e-commerce – both on the marketing and optimization side but, where needed, also on the early development side. Athletic Greens came to us saying, ‘Well, we’ve been in the market for seven years. We’ve had our ups, we’ve had our downs. We’re a fairly large company. You know, the US, something like 3% of the United States population has seen and/or interacted with something that has to do with Athletic Greens over our company’s lifespan. But we’ve been sitting in the same systems for a number of years.’ The past three years they’ve been pretty locked into the systems that they’ve put in place for growth and outreach and sales. And the question was, ‘What do we do now?’ Haha. Emil: ‘How do we move beyond this box that we’ve built?’ Not just from the question of what we have the internal capabilities and expertise to do but just from what the product itself is capable of doing. That started a conversation that led to, ok, well, understanding that takes a lot deeper level than asking us as an external agency to sort of optimize the website a bit, right? Ander: Yeah, no kidding. That’s a much bigger question. Ander: It’s something that’s very trend-based, isn’t it? Emil: And for supplements, that’s the normal game. I mean, I think some people would get quite offended by that idea. Haha. Emil: And others quite excited by how instant and moveable that industry is. But however you feel about it ethically or business-wise, whether you’re excited or not, that’s sort of the game that is played, for the most part. Ander: So that relies on a lot of advertising, and a lot of affiliate marketing as well, right? Emil: Yeah, definitely. Influence from marketing is a huge part of that, especially now with the ease at which you can develop influence from marketing relationships, particularly through social media. Of course, the content marketer approach to relationship-building in the blog world has also enabled a huge advancement in influencer marketing for supplements. And, obviously it’s not just supplements as a category, but supplements as a category that puts a particular amount of effort there to, admittedly, their great success. A lot of Athletic Greens also has their success because of that. I mean, with people like Tim Ferriss saying every week that it’s his one supplement. If he was to be asked ‘What is the one supplement that he would keep with him always?’ he always says ‘Athletic Greens.’ That’s about as good a recommendation you can get! Ander: Yeah, that’s a lot of social proof there. Emil: Yeah, absolutely. It’s relationships like that which a lot of these products are built on or inversely, people who have built their own audiences and then monetized those audiences by creating a supplement as is relevant to them. Dr Axe would be an example of a blog personality that has sort of built supplements into his own network as a form of monetization, and a few others as well. Ander: So Whole Design Studios, where you were before you went to take on this role as the interim CMO of Athletic Greens, you were focused very much on e-commerce, on Shopify specifically. That’s correct? Emil: Haha. It’s not a very common thing! But it does happen occasionally. Effectively, I took a position of being installed on behalf of Whole Design in Athletic Greens to act as an actual C-level member of the company on behalf of the questions they were asking us at Whole and being able to approach those in a much more aggressive way. I then manage my own exit that allowed whatever work I was doing internally of course to be handed off within the company but also to ensure that the agency relationships – not just Whole Design but we have relationships with maybe six or seven agencies at any one time – That those relationships were all centered around the momentum built by my time there. And that’s its own set of challenges, I think, that marketers don’t have to face too often. Agencies are sometimes victim to it but individual marketers don’t end up in that position very often. Ander: I think one of the things that you see, especially when you work for an agency or if you’re in any sort of management position above the individual contributor or whatever you want to call it, is sometimes it’s easy to lose touch with what I guess you could call the pains or the struggles of what’s happening in the day-to-day of running the business, or of just the marketing of that business in general. So when you came into Athletic Greens in this interim CMO position, was that something that you noticed? Was there any sort of shock value associated there? What was the transition like from being in this agency function primarily to working more specifically with one organization? Emil: I think one thing that’s maybe difficult for people to relate to – or maybe not; maybe that’s an assumption of its own – is that at any one time I’m always in at least three positions and have been for a very many years. Ander: Yeah, that is a challenge by itself! Emil: So the challenge of transition isn’t so difficult as the challenge of keeping the right irons in the fire at any one time. And I think a lot of professionals deal with this at different levels. I think that’s very relatable. But in my case, it’s a little bit different because I’ve worked quite a long time to make sure that all of my teams and my working relationships are dispersed. So transition for me is not so much a transition of, say, office space and an entire shift in culture. It’s much more of a shift in who I speak to every morning versus every evening. And what the out play of that work is. But as someone who now has a relationship with a number of companies where we are helping them build strategy either from an early stage or from a late stage in re-building like we did with Athletic Greens, for me it’s quite comfortable, if I’m honest. It’s a lot of fun. Everything about what I do is exciting as a result of that. I think it’s a very unique position. I think the hardest part for people in transition between companies is being able to let go of their own vision. We attach ourselves very much to ideas. And especially if you’ve been implanted somewhere to try and make a lot of change happen and only a small percentage of that change takes place, you feel like you’ve lost out, right? As a professional. Emil: You might have gotten paid. That’s great. But if you have integrity as a professional, there’s a part of you that’s going, ‘Well, I just wasted all that time because this and this and this didn’t get done’. Emil: I think as marketers especially – especially if you’re a good one – you are going to bring a lot to the table and you have to always account for all the stakeholders at hand and be able to adapt what you’re giving over to those stakeholders and expect a certain amount of fallout. In fact, if you can even schedule or design a certain amount of fallout then you can manage that even better. Emil: And I’d say that happens with every single company that we work with. My time at Whole Design, and my now closing time at Athletic Greens, running Growth Mechanics the way we do and our portfolio of several teams underneath that as well. All of these situations are such that we’re developing tactics on a day-to-day basis that need to be absorbed and bought into by a number of other people. And agencies understand that, of course, because they have to sell, to a certain extent, their approach and a certain amount of it will always get cut. But as an individual professional, to those out there who are, you know, contractor marketers, you have to always account for about 10% really getting through and you have to really make sure that that 10% is the 10% that counts. Ander: Yeah, no kidding. That is absolutely true. I can certainly agree with that and I imagine that most of our audience can relate to that as well. Emil, given your experience with entrepreneurship, as a whole, the topic as a whole, being an entrepreneur yourself and working at Google in the context that you did, how does having that foundational understanding of what it means to be an entrepreneur apply to our work as marketers? Whether we’re in one team working for one organization or we work for an agency with a number of clients? Emil: That’s a really good question. And it’s a really important consideration, I think, particularly for the modern marketer, if you will. Even within agencies I find sometimes this is a lacking component. At any one point as a marketer, you’re dealing with people, usually, who feel a sense of ownership about something, whether it’s your boss in whatever company you work for or, as an agency, it’s the company that you’re pitching and developing strategy for or developing assets for. Or, it’s the start-up that you’re doing some sidebar work for. Whatever it may be, those stakeholders feel a sense of ownership and, in a lot of cases, they have that sense of ownership because they have an entrepreneurial-like attitude about whatever it is that they’re doing. This is not true in 100% of cases by all means. Always exceptions. Ander: Of course, of course. Emil: Particularly if you’re working with the board of a company, right? Their job – even if the business is quite advanced – is to be thinking about and developing strategy around how they can continue to progress and grow into the market and think proactively about the growth of the company as a whole. Growth is really the subject there. Whether it’s a large business or you’re a start-up, a huge amount of your time and headspace is taken up by the subject of growth. And I think growth at a high level, at a theoretical level, at a push button to millions level, is a little bit soft for people. Emil: And, I think part of why is because not very many people have stepped out to try and understand what it means on a person-to-person level. If you take that step back and you look at growth from a start-up perspective or an entrepreneurial perspective where you need to not just create an impact on existing millions but develop unique, individual, first-time relationships with your first person, with your first hundred people, with your first thousand people, and if you can understand what that means and how to push and pull on those triggers, you then have a basis for communicating to millions that has completely evolved beyond how most people are thinking about marketing. So, to answer your question in a more direct way about the importance or impact of entrepreneurial thinking in marketing or in bigger business… Without it there will be an inherent slide towards failure. There will be a percentage chance that’s ever-increasing that you will distance yourself from the customer by attaching yourself to ideas, and by not taking a more grassroots understanding of what it means to build something from the ground up. If you start looking at how to build campaigns as if you were building a new business – and there’s a couple of agencies in the world that have actually published stuff about this sort of approach and I encourage everyone to go Google about it as much as you can – you start to see a flip in behavior, both on the client side but also on the agency side certainly, and then the customer responses is tenable. It’s incredibly advanced compared to what you would normally see in, say, a splash campaign. Emil: ‘What does that take? And what does that mean, to do it with one person versus ten people versus six million people?’ I don’t know how easy to take away some of what I just said was but I think in essence it’s really crucial to understand the entrepreneurial mindset to deal with clients better, to approach customer-based marketing better. Ander: That is awesome. And you know what? You actually kind of answered my next question, which is what we as marketers can do to make marketing better? It sounds like adopting this kind of mindset is going to make a big difference for a lot of us in our marketing initiatives. Emil: I think so. And, we certainly see it on the mid to small company level, right? Most of the companies that we work with are not Fortune 500, though I have historically done work with companies at that scale. Marketing Google’s programs would be part of that discussion. Emil: But, you know, it all comes down to one singular nugget and I think if anyone is to take anything away from me flapping around on this topic today, it’s really a deep understanding of the customer’s problem is the most important key to growth of any type. And the understanding of that problem is critical, not just insomuch of the ‘what they have’ or ‘what happened,’ which is, they have a problem or x% of people have a problem. That’s sort of a quantitative metric of what happened, right? You can make some decisions based off this but ultimately if you want to break beyond that, you need to understand why it happened. You need to understand why they’re feeling this problem, why they’re experiencing the pain, and the question of what comes back into understanding what they’re doing about it. But again, for every point of contact with a customer, you always need to be in a position to ask why. And if you can’t answer that – and a lot of us try and answer anecdotally, ‘Oh, well, they do it because of this or, I think that, or my mom does this, therefore I’m sure the rest of the 13,000,000 women in that particular category happen to act exactly that way,’ right? Most people tend to do marketing is by relating experiences of their own as opposed to studying the ‘why’ in a proactive way. I think if marketers – well, I don’t think, I know from what we have seen in the companies we work with over the past ten years or whatever it is – that if companies shift, if marketing shifts to investigating why and working with that as a basis for development of communication, both in direct to current customers but also in the expansion of campaigns or marketing messaging, again, it’s one of those things where the effect is almost unrelatable to marketing as we know it. Particularly in a competitive sector, the ability to key into a user’s ‘why’ versus your competitor who is selling them something completely else based on assumption, is what effectively will on any level, but particularly your bottom line, make a difference. Emil, this has been a fantastic conversation. There is some real deep stuff in there that I am really excited to think about just in my spare time, to be totally honest! And also, excited to distill some of that down into the takeaways that are going to come up shortly after we conclude this conversation here. Before we wrap up, Emil, I want to ask you what we as marketers can do to help you – What, can we check out or is there somewhere you’d like to direct us to? Whatever that might be. Emil: Sure. Well, if you want something a little more actionable about entrepreneurial process and entrepreneurial thinking then, I recommend you check out my website where my team and I tend to publish assets that are directly actionable. These are not pay-for or anything, so just go to emillamprecht.com. You can sign up for the entrepreneur starter-kit which is a really great seven-tool starter basis for investigating questions like ‘why’ and turning them into action, both on a marketing level but as a start-up, certainly on a product level. I recommend starting there if you’re into entrepreneurial mindset as a topic. But if you are a company that’s more into entrepreneurial mindset insomuch as you like to inspire it or help it or you like to assist in the development of programs, please check out my company Growth Mechanics, which is where we basically host our accelerator-in-a-box program and turn actionable insights from the data sets we collect all over the world into programs for entrepreneurs and helping companies grow. And then of course, the best thing you can do is share this podcast with a friend if you found this discussion helpful. Emil: And, you know, share it with friends, shoot me questions on Twitter if you have them @Emillamprecht and yeah, rock on with Instapage! Ander: And all of that information, of course, will be in the show notes. Emil, thank you so much for taking the time to chat once again and I am sure we will talk to you soon. Emil: Absolutely. Thank you so much for having me and yeah, looking forward to it.